This listing is for the DIY PDF PATTERN only, for crocheting this scarf yourself. Thank you for reading carefully before purchasing. 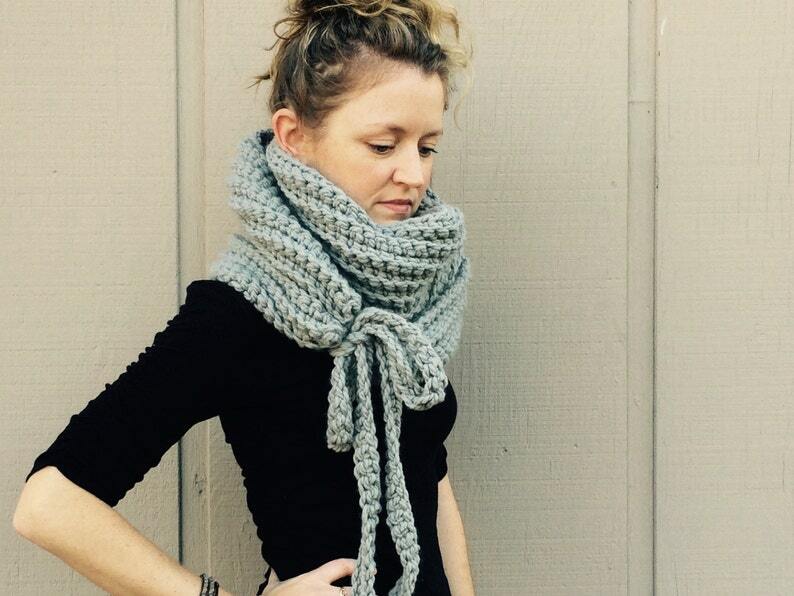 This scarf wraps twice and ties; it's crocheted in super bulky weight yarn and is super warm! The pattern makes a quick and fashionable gift, and the large weave looks beautiful in any color. 300 yards of super bulky weight 6 yarn and size N crochet hook needed. This pattern includes PDF instructions for making The Kristin Cowl. This is an "easy" crochet pattern that requires basic crochet techniques. One size fits all. Once your payment clears, you will receive a link from Etsy containing your pattern, which will be available for instant download. You have permission to sell items made from pattern. *You have permission to sell items made from this and all my patterns. The pattern itself is copyrighted and may not be reproduced or distributed in any way. *Facebook fans receive 10% off. *No refunds will be granted on PATTERNS. *All items are shipped first class US mail, with delivery confirmation. Great pattern! Comes with clear instructions that are easy to follow and understand. This infinity scarf is so pretty. The pattern is easy to follow and instant download is so convenient. Thank you! If you are not completely satisfied with your purchase, I will do whatever I can to remedy the situation. Please contact me! PDF patterns are not refundable, due to their digital nature; I do not give refunds on PATTERNS. Please check carefully whether you are buying an ITEM or a PATTERN. Thank you. You are welcome to sell all Items made from my crochet patterns; please place a link to my shop in your listings. Items made from my patterns may not be made or sold in mass production. The PDF pattern documents themselves are copyrighted and may not be redistributed or passed on in any way, in part or whole. Please direct others to my shop to buy their own copy. Photos are all property of Swellamy Crochet and may NOT be used in any way by anyone else.